Contest time once again on Amazon and this time it is related with the Star Wars special edition. Answer basic questions and stand a chance to win OnePlus 5T this time. There are a total of 5 questions in this contest of 8th December related to performance, power etc. of Oneplus 5T device. On answering all correctly, you get chance to win Oneplus 5T phone for free. We have also added answers to all 5 questions below for today’s contest. Check them out. We have handpicked best 100 deals from Flipkart’s Big Shopping Days. Do not miss to check them. 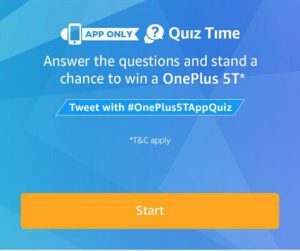 How to win OnePlus 5T in riddles contest ? 2. Open the app and you will see a banner about the Amazon Oneplus 5T Riddles Contest. Click on it. 4. You will now see a set of 5 riddles about OnePlus 5T. Q1. 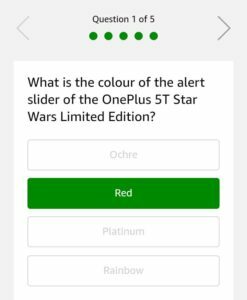 What is the colour of the alert slider of the OnePlus 5T Star Wars Limited Edition ? Q2. In Star Wars parlance, what is common between Luke, Qui-Gon and Obi-Wan ? Q3. What is the pre-installed theme in the OnePlus 5T Star Wars Limited Edition Phone ? Q4. What is the name of Han Solo’s son who features in the Last Jedi ? Q5. 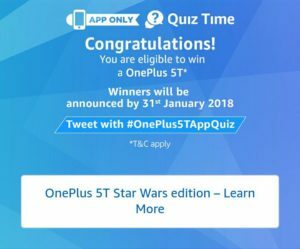 When does the sale for the OnePlus 5T Star Wars Special Edition begin ? 5. After answering all 5 questions correctly, you will get a Congratulations message that you have been entered into a lucky draw. Now keep your fingers crossed and wait for the results to be announced by 31st January 2018. Once you have signed-in to the Amazon.in App, you can participate by navigating to the page where 5 (five) questions or riddles will be posted during the entire Contest Period. I have given all the answers correctly..
Now it’s tym to hope for the best..
Now it’s tym to hope for the best. Thanks a lot amazon and oneplus also…..
level no. 4 question no. 3 is wronge ans. Hoping for the best. OnePlus never fails to impress. I got 3000 amazon pay Balance for some previous contest, thank you dealnloot. ONE PLUS 5T IS THE BEST!!!!!!!!!! I answered all the level’s without other s help so I will win? In the time of 1.6 am so i will win? I will answered all the quiz so can u select to me in lucky draw? Can we participate in more than 1 competition in Amazon and if not then why can we? Please tell me the winners of 30 November for smartphone. I don’t remember the name of the brand but it was for smartphone in Amazon .